It is probably fairly safe to suggest no Eighties pop group (Culture Club apart, but that’s a different story) polarised both public and press opinion quite like The Smiths. I can recall reading (in the space of a few weeks in the same publication) the band being referred to as “The Eighties’ Beatles”, before being on the receiving end of a dismissive article claiming their whole success was due to nothing more than a calculated and concerted campaign by sections of the music press to revive the fortunes of the ailing, but beloved, Rough Trade record label. which perhaps represent the Seven Musical Wonders of the Modern World. I am not going to spend any time dissecting any of the above, as such stuff has been done to death in publications and web pages over the years, but I should perhaps like to write briefly about one song; a rather lesser known one: Rubber Ring, as this 'un sort of sums up what this blog is all about. Morrissey’s lyric, to my simple head anyway, asks us all when we become older and wiser with, one assumes, more sophisticated tastes (i.e. become a "Clever Swine") not to disregard or forget the songs from one’s youth. Stay true to these songs, and they shall always remain with you. The lyric, although perhaps I am being overly fanciful here, almost appears to have been written from the perspective of the songs themselves, as they ask “Do You love Me like You used to?” But ultimately, hey, what do I know? 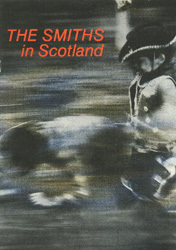 In Autumn 1985 The Smiths embarked on a short seven date Scottish tour, with support from Glasgow band Easterhouse. We Scots were even given our own programme and memorabilia! An honour indeed. Proceedings opened with a taped intro of Prokofiev’s Dance of the Knights. You know, the strident ominous piece which has now regretfully become associated with Alan Sugar’s pug-like fizzog, as he gives himself another hard-on by sacking someone. Morrissey, when he arrived on stage, greeted us all with an impressive burp into the microphone, for which he offered a particularly insincere “Pardon”, before the band ripped into a rockabilly-tinged rendition of Shakespeare’s Sister. Next up was I Want The One I Can’t Have, the first of seven tunes which would be aired from the Meat Is Murder album. Early in the set the band covered James’ debut single What’s The World; Morrissey informing us afterwards “That song was written by erm……” before either genuinely forgetting, or just losing interest in the business of interacting with us. This tune was not the only unfamiliar one this evening, as we were treated to early renditions of a brace which would not see the light of day on vinyl for eight months: Frankly Mr Shankly and Bigmouth Strikes Again. Although the latter seemed to be familiar to a number of folks around us, who had been bellowing “Bigmouth!” for some time. I had assumed at the time this was aimed at Morrissey himself, rather than being a song request. The version of Still Ill was superb. I don’t think there is a better example of Johnny Marr’s unique style; his rambling shambling arpeggios soaring out across the hall. Rusholme Ruffians was next with the Elvis tribute tagged onto the start, whilst the main set closer How Soon is Now was dedicated by Morrissey to “anybody who has ever had to use Blend The Blemish” (some sort of acne-covering make-up I assume). There were three encores (six songs in total), the most memorable being Meat Is Murder. It has never been one of my favourite compositions, but this rendition really was quite special: Morrissey’s voice just managed to stay on the earnest side of histrionic, but it was the band’s contribution which raised the song above it’s rather pedestrian studio counterpart. Folks hooted for This Charming Man, but were put down with a quite emphatic “No!” by the Man, and we had to make do with Miserable Lie to send us home happy. One minor gripe – not even a gripe really, but an observation: The Meat Is Murder songs represented, in many cases, a significant step up in complexity from the previous album, and many of them really required a second guitar on stage to do them justice. In these pre Craig Gannon days, The Smiths solved the problem by doing what rock bands had been doing since the late 1960s, by just jacking up the bass. Consequently the sound quality perhaps suffered a tad. I shall write a touch more about Morrissey in his own page ( I saw him in concert in 1991), but would perhaps like to mention the other folks in the band here. During the unpaid royalties court case in 1996, the singer shamefully described drummer Mike Joyce and bassist Andy Rourke as “replaceable as the parts of a lawnmower”. I am not going to argue such a fatuous statement, but I think anyone who listens to Joyce’s contribution to tracks such as The Queen is Dead and How Soon is Now could only take umbrage at Morrissey’s assertion. Similarly Rourke’s bass work on the likes of Hand in Glove, You’ve Got Everything Now and Rushholme Ruffians is little short of astounding. They say one should never meet one’s heroes, and I think I generally concur with that, (especially so given my encounter with Lee Kerslake - see Uriah Heep 2), for I harbour no desire to meet any of my (still living) musical heroes: David Bowie, Jon Anderson, Julian Cope, Lou Reed, Van Morrison. To that list I would certainly add Morrissey, but not Johnny Marr, who has always struck me as the real talent behind The Smiths. He appears to have remained a genuinely funny, down-to-earth guy with a true perspective on how utterly facile and self-aggrandising this Rock ‘n’ Roll business really can be. Yes, I think I should rather like to meet Johnny Marr some day, and buy him some Guinness.